Awesome day in the mountains! Peter let me join his annual Mountaineers climb of Sahale. There was some of everything – bushwhacking, slab walking, scree scrambling, snow, glacier, some exposed scrambling, and oh so many switchbacks. I can see why this is an absolute favorite of folks who climb it. This climb offered a lot of new experience in technical glacier terrain. This was definitely a step more challenging than Baker, Shuksan, Glacier, etc. I was glad to get this experience with a group like this rather than a small private party o_o. The group did great! It was super rewarding to see students experience these kinds of things for the first time. The smoke got in the way of seeing things that were far away, but the close up views of Boston Basin, the surrounding peaks, and even Johannesburg (for the morning) provided fascination throughout the day. The trip was off to an auspicious start when we arrived at the Denny Creek trailhead to find honest-to-goodness rain. The forecasts had called for 20% of showers until 11am. Well, we were in the 20%. Optimistic that the weather would clear up, and looking forward to getting some exercise we carried on and started up the trail. We made quick time to Melakwa and then upper Melakwa lakes. The rain abated quickly, but the clouds remained, so we hung out at upper Melakwa for about 30 minutes. 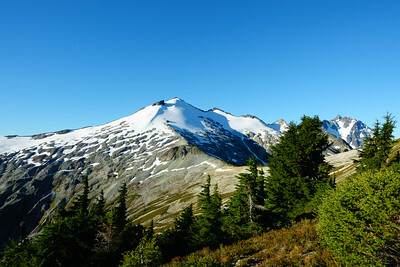 With a potential of clearing, we decided to head up the climbers’ trail toward the summit. I just wasn’t feeling it. This is odd for me to admit, but I decided I really just didn’t want to be there. It wasn’t for lack of good company, skill, or even objective hazards. My head wasn’t in the game and every step forward felt like I was committing myself to something I really didn’t want to do. So about 50′ into the descent to the summit push I called it for myself. The group decided to turn around with me. I’m not a fan of feeling that way in the mountains. I understand there are off days, but this was my first mental off day in recent memory. I think it was some combination of climbing season fatigue, and mental fatigue from the recent long runs, and physical fatigue from my long run on Saturday. It’s useful to be humbled, and I’ve been thinking about it some and the true lesson here is unclear to me so far. As you may know I’m training for my first 50k. The training runs are starting to get longer. This weekend it was 18 miles on Friday. Friday! Don’t these training plan people know we have to work?? So I put an out of office appointment on my calendar and went in search of straightforward trails. One of the things that’s amazing about living in North Bend is that so many trails are so close. One of these is my favorite, the Ira Spring Trail up to Mason Lake. This leads to miles of trail leading to so many lakes. Another stunning trip, this time an attempt at Mt. Olympus. We turned around about 1000′ below the summit because of weather. 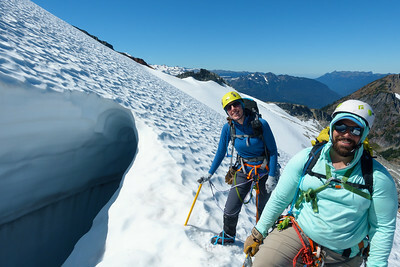 Super cool climbing partners, beautiful terrain, and the refreshing disconnect of the world from four days. Olympus has it all – it’s isolated (the standard route is a 17mi trail approach), has a super cool glacier to cross, and tops out to a small summit after a short 5.4 rock pitch. Left the cars at 10:12am with a great team, high stoke level, and heavy packs. We made good time to the Olympus Ranger Station, 9.1 miles in the trail. The trail takes you through old growth forest with occasional views of the river. Salmon berries and red huckleberries are in season, and they provide tasty snacks throughout. The trail is well developed and there are plenty of spots to take a nice rest. The stream crossings are great, with only one or two minor challenges after 7 miles in. We made it to camp at 3pm, found a great camp sites along the river, and started tucking in for the night. We rose early, ate breakfast, and left camp at 7:26am. The trail continues through incredible rain forest. After about 3.5 miles, the trail crosses the river and starts a steady climb up to glacier meadows. 3000′ and many switchbacks later, we arrived at the washout before glacier meadows. Here the trail descends down about 75 feet by way of a wooden rope ladder and rope next to it. We made our way down, and then back up some scree to the other side and then walked the few minutes to camp, arriving at 2:30pm. We found a great campsite up high along the creek, cooked our hot meals, and turned in early. Summit bid day! Up at 12:45am for a 2am start. We started under gorgeous, clear skies. The moon was almost full and the stars and planets were out. The first mile or so gains 1000′ along what is mostly trail and the occasional snow field to gain the top of the lateral moraine. You walk along the moraine for a bit and then drop down to the glacier. I’d been warned that getting onto the glacier can be a challenge and to look for the bootpath. We found the bootpath, and then we lost it. We spent about 45 minutes trying to find the way down, and ended up on some steep, hard dirt. No fun. Eventually we decided that just going straight down from where we lost the boot path was the only way, and this turned out to be doable but still not great. We made it onto the snow at about 4:30am. 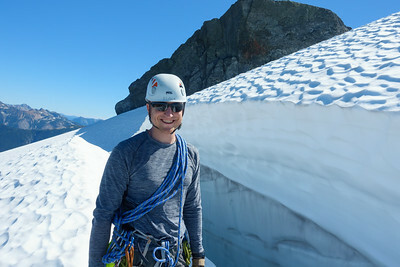 We roped up, put crampons on, and then crossed the blue glacier toward snow dome. The glacier is so cool! Enough snow had melted out that we were walking on blue ice. I had no idea how many striations, pools, and just general coolness there was. I really, really want to go back. Gaining snow dome was straightforward. The slopes were occasionally steep, and we had to travel the occasional rock bits. As we were climbing we noticed the weather start to change. While glacier meadows and the glacier were above the low clouds in the Hoh river basin at the start, clouds started rising and also coming in from the west off the ocean. We decided to keep going, since visibility was fine and it was just cloudy and windy. Here we met a party of six that had decided to turn around due to the weather. We kept going for about another 10 minutes when the clouds dropped even further and the rain kicked in. Knowing that we wouldn’t be able to make a summit bid with wet rock, and that we were losing visibility of the route, the decision to turn around was easy. I thought it would be more challenging than it was to travel 20+ miles and then turn around when we were so close to the summit, but good to know that I have it in me to make sane decisions. Even better, Arthur proposed to May and she said yes!! They are such a wonderful couple, and I’m super stoked for them!! We turned around, down climbed the route, crossed the blue glacier, and then found our way back up to the moraine. In daylight I could see a couple boot paths that traversed, but they ended up in just as crappy terrain as where we were. I bet they worked better when the snow level was higher. Anyways, we went up the way we came and then started down. Back in camp at 12:45pm. A spicy, hot lunch later, we schemed about whether we wanted to stay or wanted to bail. The group liked the idea of walking out some more, and the idea that we’d walk out to the cars started building momentum with Elena and I. We packed up camp and started down. Our goal was to get to the 13.2 camp sites and make a decision about whether to call it or continue there. We made it that camp. Arthur and May were done, and by then the idea of walking all the way out seemed the inevitable choice to Elena and I. We parted ways (both pairs of people had a full set of group gear), Elena and I continued on to the cars. We stopped at the Olympus Ranger Station at 9:30pm for a bathroom break and to do some foot care. The first heavy(ish) rains of the trip rolled in, it was dark, and we were tired, so we abandoned our quest out and put up a tent. We were happy to be dry, and were quickly asleep. Up at around 6:30am and, after a hot breakfast, left at 8:30am to make our way out. Back out through the same incredible old growth and next to a blue river. With a sun break, we stopped lazily at 5 mile island to dry out, get some more water, and have a snack. We made it back to the cars at around 2:30pm. Moons ago I mentioned to Eric that I was interested in trying longer distance backpacking. As what I’m sure was an incredible practical joke, earlier this summer he invited me to join him and some of his friends backpacking the Timberline trail around Mt. Hood. 40 miles, 4 days, and 9000′ of elevation gain. In some delusion I gratefully accepted the invite, and months later found myself pulling into the Sandy Springs camp at 9:30 on a Thursday night. We were starting at 7:30 the next morning. Four days later, dusty, smelling awful, and ready to see running water we emerged right back where we started, and I was stoked! The trip was amazing! Disconnecting from the world and being fully present in the situation for four days was true bliss. Physical exertion focuses you, and when topped by accomplishment elates. I’m already planning some extended backpacking trips for next summer. Something strange happened on this trip: around day 2 we realized that we were hiking at about the same pace as other folks, and we started getting to know them better. There was the couple who had been smoked out of part of the PCT, another couple who had done this several times before and were excited to see the new trail reroutes, folks with kids, kids without folks, and folks doing this all by themselves. These folks had similar experiences from very different perspectives. By days 3 and 4 we talked freely, shared our experience, and the trip was enhanced. It became to me more a pilgrimage than a trip through the wilderness. In the latter I would expect solitude, peace, and natural splendor. With the former, a sense of common purpose and toil. This wasn’t at all what I expected and was welcome. Ah, first day. Hopes, ignorance, insanely heavy packs. Taking a picture out of the gate I noticed my camera was hosed. It didn’t make sense to carry it the whole time so back to the car I went. I get to start this trip twice. Cool. The Timberline trail is on the PCT for the entirety of this leg. PCT hikers travel like the wind. We would be aware of a group approaching. Within moments they were blowing by on their way to make their 20+ mile days. These hikers are like container ships, always moving faster than you expect. Many of the folks we saw this day would ultimately be affected by the Eagle Creek fire that closed the PCT north of Mt. Hood to Cascade Locks. Our day took us along the PCT to the Paradise Park Loop Trail. There was some confusion, as the rangers had mentioned that trail had tons of blowdown. We saw signs that indicated the opposite and spoke to hikers who had been on the trail. Deciding to take our chances we lept on it and discovered … nothing. Not a single blowdown on the trail. There was some nice big pieces on the PCT just south of there. That pleasantness discovered, we motored on up to find spectacular meadows, full of bees. BEES. Yes, really. Thousands and thousands of bees. My hackles up we moved on and had lunch just past Lost creek. Turns out Lost creek is the last water source before Sandy River. I wish we’d known that. After lunch, and major lunch envy on my part, we made our way toward camp. In search of water, and in an attempt to avoid having all the camp sites snagged, I ran ahead and caught a camp site just before the Sandy River crossing. Like whistling workers we departed camp after a wonderful night’s sleep. Quickly we found ourselves attempting to cross Sandy River. This was our first major crossing of the trip and some calibration was in order. Eventually we found our way and continued on toward Ramona falls. We departed the PCT shortly before reaching the falls. The falls were great and helped us gain steam to begin our climb for the day. See, day 1 was all about the downhill. Difficult on the joints, but easy on the muscles and lungs. We had descended 2000′ more feet than we ascended on day 1, which meant that we would be making that up for the rest of the trip. The Timberline trail is full of nice gradual climbs that go on for ever. You can go measure it. It’s a fact. Forever. After traveling on trails overgrown with dense brush for much of the morning, our afternoon brought us to sections of the forest that had been burnt out a few years prior. These burnt out sections were a stark contrast, and a reminder of how quickly life can change. What was prior a lush, verdant forest was instead miles upon miles of monoliths. Disaster struck one of our members today. She had been dealing with pervasive foot issues all summer and today woke up with knee pain. She made a valiant effort but was done. The trooper she was, she elected to walk to cloud cap where her husband would pick her up. She was amazing. Our group ended up splitting her pack. Before cloud cap was the Elliot creek crossing. A few years ago this crossing washed out. Over the past year some wonderful folks rebuilt the crossing. The kicker is that the new crossing was 600′ in elevation lower than the old one. Down we went, switchback after switchback, and up we went, up another 13 switchbacks to climb and meet our party member’s husband. With C on her way, we ate lunch and decided what we wanted to do for the afternoon. See, our plan was to make at least Gnarl Ridge, if not the Newton Creek camping area. We lost a lot of time getting C to cloud cap, so we had a decision to make. How much further would we go in the heat of the day? Did we want to carry enough water to camp at Gnarl ridge (we didn’t think there was any more water until Newton creek)? Or, do we take less water and book for Newton creek? We opted to attempt Newton creek. This was a committing decision and as such took the requisite debate. Up we went to the Lamberson spur, the high point of the trail. Here the trail is soft sand, in the exposed alpine, and relentless. Here the views should be spectacular but were instead obscured by the smoke from the Eagle Creek fire. The summit achieved, we found the most wonderful creek from snow melt. There were several decent sized snowfields above the high point of the trail, and they provided that amazing life giving thing that is water. This changed our decision. Tired, and with hurting feet, our group opted to water up and attempt a Gnarl Ridge camp. That we did, and found a wonderful camp site on the ridge. We crossed the white river and were just a hop, skip and a jump away from finishing the trail. Well, turns out the last 1000ft of elevation gain is up a sandy slope. Turns out glaciers generate moraines, which are full of sand. This was a wonderful end to our journey. See, if it was too easy then the climax would have come too early. And then that was it. End of the trail. Back at our starting sign. Back to the cars. We were among the well dressed crowd enjoying their labor day up at the Timberline lodge. Naturally, we left immediately and headed down for burgers, shakes, and fried food. Summit to ourselves? Check. Panoramic views of the North Cascades? Check. Meadows, ridges, and easy terrain? Check, check, annnnd check. Mary had been talking about Ruth for months. So, looking for a moderate late season climb we decided to do Ruth in a day. We left Eastgate at around 1:45 and promptly ran into northbound traffic. Based on the amount of cars I saw carrying full loads of outdoor gear we avoided rush hour to run smack into everyone doing exactly what we were doing. No matter, we made it to Bellingham around 5. One quick stop at Panda Express later and we were on 542 to continue our pilgrimage to the north. Only one wrong-turn later we found ourselves exploring the Silver Fir campground to find it completely, 100% full. Consoling ourselves with the thought that everyone looked super settled in already, we switched to our backup plans: Hannegan camp. We knew there was camping at the trailhead and we hoped we wouldn’t be too late to snag a spot there. Our worry was for naught: all but two of the camp sites were open and we took our choosing. Nice and flat, close to the bathrooms (maybe too close), and enough room for camp chairs. Ah, camp chairs, the luxury of car camping. Saturday we started down the trail at 4:15 on our way to Hannegan pass. Walking under the stars is magical. All the usual subjects were out: the dippers, Orion’s belt, the Milky Way, and so on. (man, I’ve gotta learn more constellations…). Trail miles passed by quickly in the dark, and we found ourselves at Hannegan pass around 6:15 to watch the sunrise. An easy 15 minute break later we started up the bootpack toward pt. 5930. Up and over a a little hill and we found ourselves staring at what looked like a vertical tree-covered slope. I saw a trail, and saw it disappear into what looked like a drainage. “Surely the boot path doesn’t go straight up this thing?” I asked. Turns out it did. Loose rocks, steep dirt, crappy roots. Thankfully we weren’t carry overnight packs as that would have been a real mother… All things come to and end and we rejoined the world of easy walking. We traversed around pt. 5930 on a boot path in the scree and got our first really good look at the ridge and the rest of the route to the summit. 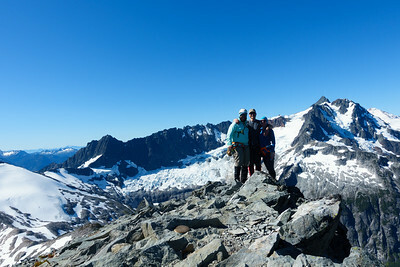 Our images of misery were quickly replaced with tremendous views of Shuksan, Mt. Baker, the North Cascades National Park, a heather-filled ridge, and a route all to ourselves. We descended to the saddle and walked on the rock ridge until about 6100′ where we decided to rope up and enter the glacier. We took a leisurely break and futzed about getting our gear on. Chris led, I was in the middle, and Mary in the back. We quickly found ourselves side-hilling on decently hard snow. We didn’t have far to go and quickly ended found ourselves at the scree-covered summit pyramid. Approaching the ridge on climber’s left we found a spot with no moat concerns, unroped, took our crampons off, and hopped on up to the summit. We were rewarded with 360 degree views of AWESOME. Shuksan and Baker were within throwing distance. The border peaks, Goat Mountain, Mount Larabee, Copper Ridge, Pass creek, Glacier, Rainier, Puget Sound and the straits, and on and on and on. Just amazing. And and and we had the summit all to ourselves. We lost ourselves in our lunch, taking photos, and just lazing around. An hour or so later we resigned to our descent and started making our way down. On the way down we decided to go check out the notable crevasse at 6500′. This was Chris’ first crevasse encounter. We placed a picket (Chris’ first glacier pro!) and hung out for a bit. That aside over we descended the rest of the glacier to meet our first other people for the day: a group of two gearing up to ascend up the glacier and to the summit. After packing up our gear, we started to mosey back down. The ridges and views were still amazing. We ran into a Mountaineers group who were heading up to Ruth and then were going to traverse over to Icy the next day. Overnight packs are for suckers, but don’t remind me of that the next time I sleep in the alpine. (By the way, there were tons of nice bivy spots along the ridge and at the summit. Just need to find water …). Descending the steep, crappy slope was our only obstacle on the way out. We ran into a few other groups coming up and none of us managed to hurt each other with rock fall. That taken care of, we crested the knoll and ended up back at Hannegan pass. I was out of water (3L down) and Chris & Mary were low as well, so we filtered at Hannegan camp (the stream near the bottom of the steep section up to the pass). Sweet, glorious water. From there it was the usual slog out to the trailhead. We arrived back at camp, took our boots off, let the foot-throbbing die down, packed up, and expedited our departure to get food. Our first choice was the beer shrine past Glacier. We had high hopes right up until we realized we’d be #9 on the waitlist. The pizzas looked good but I’ll just have to save that for another time. We ended up at Boomer’s in Bellingham. Too much food later we were back on our way home. So my road trip begins. A long morning wrapping up getting out of home gets you not very far. Leaving home, I traveled East over the pass and turned north on highway 97 at Cle Elum. The construction is making good progress East of the pass; the drive goes much smoother than it did a few years ago for sure. Made good time through Wenatchee and continued north on Highway 97 along the Columbia River. This is typical Eastern Washington territory – hot and dry with large hills and river-cut ravines. 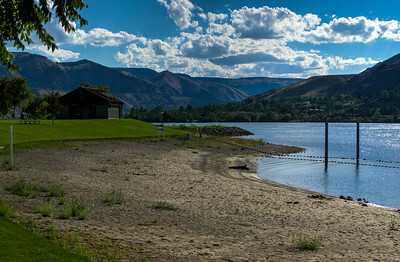 Just before highway 97 crosses the Columbia sits a riverside park. I couldn’t resist and went for a swim and hung around the park to dry off. After the nice break, I continued to travel north and hit sunset just before the border crossing. I was graced with a beautiful sunset and partially cloudy skies. 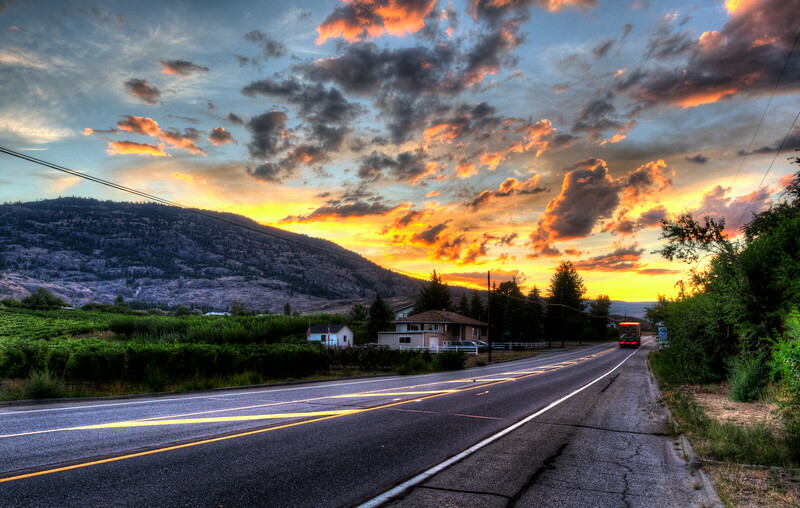 The border crossing was easy – I waited for Canadian Customs to process only one car. What a difference from the 3+ hour waits at the I-5 crossing! Dinner at a pizza place about 15 miles south of Pendicton. While the food was just okay, the owners were warm, welcoming, and up for conversation. And, they were the only place open in that town anyways. Next mission: try to find a spot to stop. I eventually made my way into Pendicton following signs for campgrounds near a provincial park. Well, no joy. I found the park but there was clearly no camping there. And with signs like “Black bears active” and “watch for snakes” I was having none of it. Besides, the place was located up a steep, narrow, dark road far away from people. It looked like the kind of place I’d go to when I wanted to get away from people – you know, like for a drug deal or something (not that I’ve done this, guys). Well, I was having none of that and eventually found a turnout that looked promising. Psych! Never mind. Turns out that road gets a lot of traffic. Combine that with the 80 degree temperatures and there’s no way that I’m able to get any sleep. So, further north I went along the massive Lake Okonagan. I found a provincial RV site to spend the evening. Check out this cool picture I got before I even started! 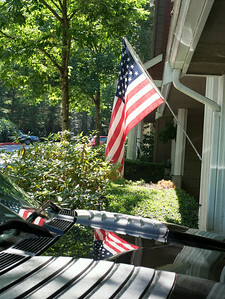 I like flags, I like color, and I like reflections. The flag is in this photo 3 times! 3 is better than 1, right? 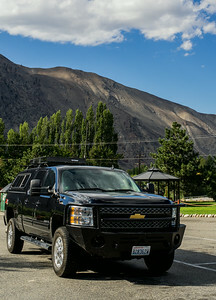 Photo from the first stop outside Wenatchee. The Columbia river, with aforementioned swimming hole. How tall is that Dandelion? 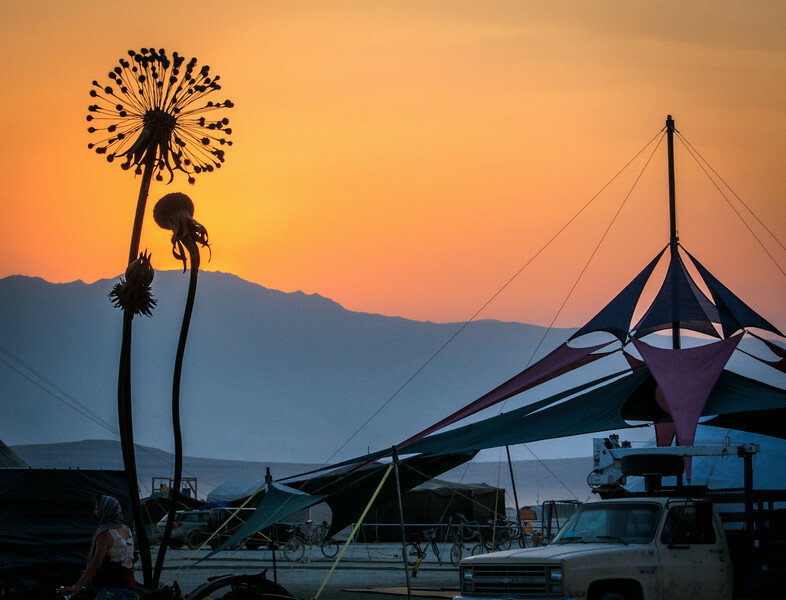 Burning Man is full of wonderful things. Setting up camp in 2012, we noticed that the folks across the street from us were erecting a massive dandelion. And, of course, flames come out of the top. Of course. Here’s a picture of that dandelion. I quite like the photo, but am especially proud of what I was able to do with it. I’ve been getting more comfortable with Lightroom lately. Here, I pushed the saturation on the oranges and the yellows to really bring out the sky. It’s been a few years and I don’t remember exactly what the sky looked like back then, but I’m sure it was something like this. Where in the world would you go with a week’s notice? Sometimes the best laid plans don’t work out. This happened to me recently, and that means that I get to plan a new trip. 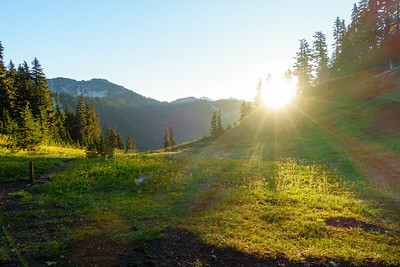 Instead of backpacking through Washington’s beautiful alpine lakes wilderness, I get to decide where else I want to go. I decided on Jasper, AB. I am fortunate to have a tremendous number of beautiful places to visit starting from my home base in North Bend, WA. The alpine lakes wilderness is on my doorstep, there are numerous other national forests, state parks, and national parks all within several hours of driving. This time I wanted something further. I had a rare 6-days off from work and it was time to go exploring. First the Northern Territories sounded right. Whoops. 30 hours of driving just to get there. That’s a lot of driving. Maybe then Alaska? 45 hours of driving. Nope. Further East are the Canadian Rockies. 14 hours. Yes, that’s it. I’ll find out how it is going up there. I’m looking forward to the journey and the exploration. Guide book in hand, major routes known, let’s go see what Mother Nature has to offer.